SAN JUAN, P.R.—The governor of Puerto Rico signed an executive order banning conversion therapy for LGBTQ minors in the U.S. commonwealth earlier this week. “As a father, as a scientist and as the governor for everyone in Puerto Rico, I firmly believe that the idea that there are people in our society who need treatment because of their gender identity or whom they love is not only absurd, it is harmful to so many children and young adults who deserve to be treated with dignity and respect,” Puerto Rico Governor Ricardo Rosselló said in a statement to the media. The decision to sign an executive order came after failed attempts by the legislature to end conversion therapy, a harmful practice intended to change the sexual orientation, gender identity, or gender expression of LGBTQ people. “Senate Bill 1000, tried to eliminate such therapies in Puerto Rico, however, after several legislative debates and hurdles by conservative legislators of the House of Representatives, the Senate project failed to pass,” said Alberto Valentín Camacho, Governor Legislative Advisor, and executive director, LGBTT Advisory Council of La Fortaleza de PR. Executive Order Number 16-2019 was approved on March 27, 2019. This Order prohibits any governmental or private entity or health service provider from practicing conversion therapy, Valentín Camacho said. The social media sphere has widely lauded the governor’s order. On The Rainbow Times’ social media sites alone, the publication’s post announcing Rosselló’s executive order has gone viral, reaching upward of 35,000 followers, creating more than 3,500 active user engagements and receiving hundreds of shares within a 24-hour window. Although Rosselló used executive privilege to order the ban, he is met with substantial backing from major education, health, and religious organizations. “A number of prominent national professional health associations—including the American Medical Association, the American Psychological Association, and the American Academy of Pediatrics, among others—have issued public statements opposing the use of conversion therapy because it is harmful and ineffective,” read a recent Williams Institute study. 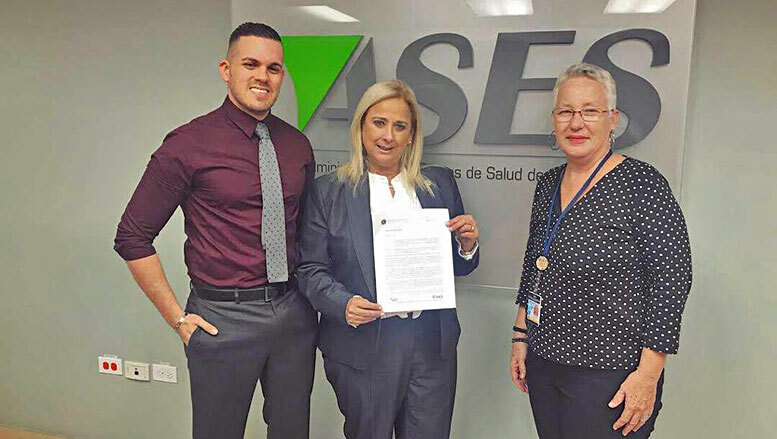 L-to-R: Alberto Valentin, Governor Legislative Advisor, and executive director, LGBTT Advisory Council of La Fortaleza de PR, Mrs. Angela Avila, ASES Administrator (Health Services Administration, ASES in Spanish), and Johane Velez, Governor’s Women Council President. Failure to comply with the conversion therapy ban would result in tangible consequences for the island’s practitioners. The Executive Order directs agencies and departments to “restrict benefits, permits or licenses to any health service provider that does not commit to prohibiting these therapies as part of their services,” Valentín Camacho said. According to the UCLA Williams Institute study, more than 700,000 LGBTQ people have been subjected to the “horrors of conversion therapy, and an estimated 80,000 LGBTQ youth will experience this unprofessional conduct” in coming years. In Massachusetts, a conversion therapy ban has not yet been signed into law. However, the state’s governing bodies have passed a bill to do so and Mass. Governor Charlie Baker has expressed likely support of its implementation when a copy of the bill gets to his desk, The Rainbow Times reported. “Today we are moving in the right direction, today Puerto Rico becomes an example to follow …” Valentín Camacho said. [This story was originally published on the April 4, 2019, issue of The Rainbow Times]. Be the first to comment on "Puerto Rico’s Governor Signs Executive Order Banning Conversion Therapy"